Making the very best of the space available becomes possible with a mobile shelving system. In contrast to fixed shelving, only the aisle currently in use is open, an arrangement that almost doubles the available storage space. 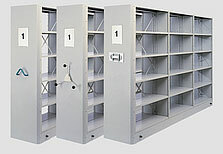 The operation of the mobile shelving is effortless and ensures rapid and problem-free access to the materials kept in archives and stores. The sturdy system of running and guiding wheels in their tracks moves around heavy loads with little effort. 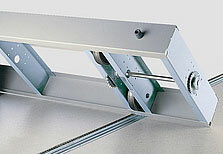 The steel tracks with inside guidance are laid on the unfinished concrete or finished floor on a platform, placed flush with the floor.